I cannot explain everything in just few characters i got for this review. This hostel is the best! Owner and staff are superb. You will feel like it is your home! I got such a nice memories from this place that i will never forget! They have superb kitchen. Location is just 6-7 min walk from Port! Breakfast is Fantastic❤️ It is super clean place. Atmosphere is very good, scenic views from the terrace. Luka’s Lodge is home away from home. If you are coming to hvar, stay here undoubtedly. 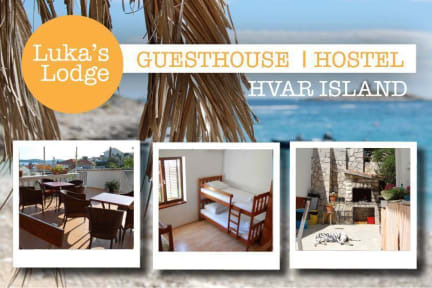 Luka's lodge made for a great home base while exploring Hvar. Luka sat down with my girlfriend and I as soon as we walked up the stairs and went over all the amazing things to do on the island. We were able to rent a scooter right beside the hostel and explore the island and some hidden beaches. Once we got back each day Luka was there to greet us, he is a terrific host. We even stayed an extra night because the lodging and island were so great. Would highly recommend. I felt like it was home away from home. As a solo traveler it was nice that Luka interacted and helped us have a good time in Croatia. Vanessa helped me get a spot on a Blue Cave tour and it was fantastic. Staying at Luka’s Lodge was almost like visiting family you like but with the independence of being on your own. There is a beautiful porch with just the right amount of sun and shade that has a view of the Adriatic. This is a nice location to have as a home base while you are in Croatia. I had a great time at Luka´ s Lodge. He and all the staffs are lovely and made me feel very comfortable. The breakfast is amazing... delicious pancakes in the morning. The beds, bathroom and kitchen are very clean. I also had a lot of fun because of the Pub Crawl and Kiva Bar. Hostel is very close of Ferry boat and the center area and you can take your meals admire the beautiful landscape of the sea. I totally recommend. I had an amazing stay at Luka's hostel. The hostel is very nice and with the best staff that goes out of it's way to make your stay comfortable. I even rented a scooter from them and it was cheaper than doing so outside. Luka is a great guy, I wish every hostel was like Luka's Lodge and every hostel had a Luka!! Thanks. I loved Lukas Lodge. The staff were absolutely amazing and Luka himself is a total sweetheart. Everyone who works there is genuine and makes an effort to ensure you have a great stay. Staff kept the place very clean and the beds were comfortable. Pancakes in the morning were delicious. I met an awesome group of friends there that I had an amazing time with. I also enjoyed that the hostel wasn’t directly in the city center, it felt more relaxing. City center was only 5 min walk away! We came at the very end of the season, so everywhere was a lot quieter. All the staff at Luka’s Lodge were really friendly and very helpful and made us feel really welcome. They gave us some great recommendations. The rooms were clean and tidy, and the location was just a short walk from the old town. We would definitely consider returning and would recommend to friends. We even had a gift of lavender when leaving, really lovely touch. 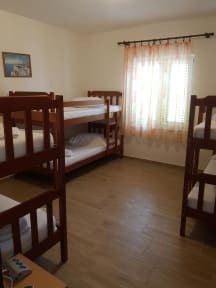 My favourite hostel in Croatia. Everyone was super friendly, even though it was quieter season. The family atmosphere got all in the hostel involved in bar crawls, hostel BBQs, mountain hikes at sunset, pre-drinks every night and even a boat day together! I booked for 3 nights. Loved it there so much I extended for 2 more nights! Definitely will stay here again if ever back. Breakfast included was a bonus. It would have been better if breakfast was a different each day, not only pancakes/cereal. Had a really nice stay here. The staff are really helpful and friendly. They gave heaps of good recommendations. Breakfast was good and the hostel was kept really clean. We arrived here just off season so the atmosphere was quiet. Location is good, although it is a short walk from the main town of hvar. Wasn't a problem though if you are happy with a small walk.